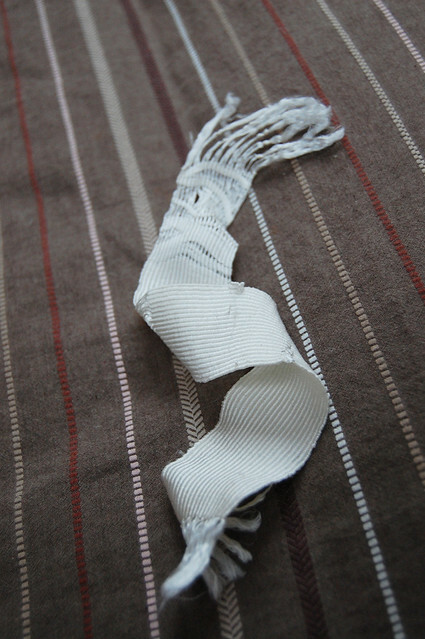 here’s how it came off – coarse and stiff due to the sericin remaining in the threads. degumming involves gently simmering with an alkali and a surfactant (soda ash and synthrapol respectively). i used 1 tbsp soda and 2 of synthrapol and cooked for just over an hour. following degumming 2 things are obvious : the fabric is mush softer and more flexible; it’s also sleazy (i think that’s the technical term :D). 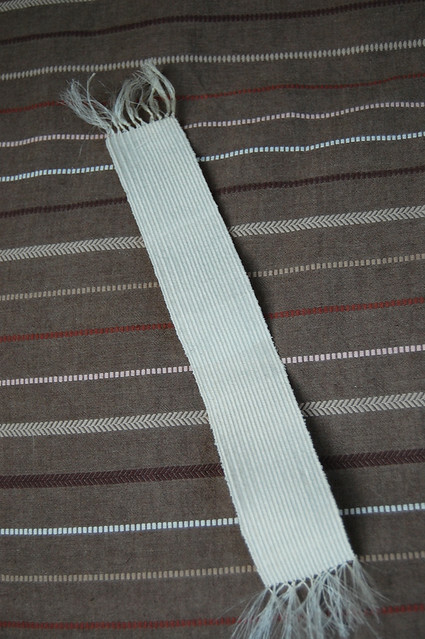 the weft threads slide a lot on the warp. part of my degumming was squeezing the cloth between my fingers to remove the jelly-like gum and the threads packed down as you can see above. on drying they were even slidier – they pack down into half the length of the warp. 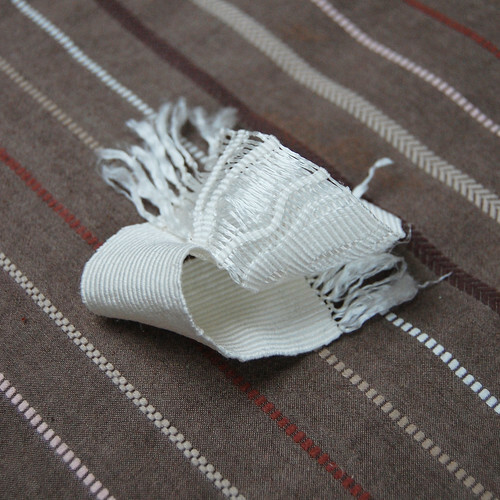 this tells me my sett was too wide – i didn’t have enough warp ends to make any kind of balanced cloth – and the slipperiness of the cleaned silk makes this even more apparent. the other thing that jumps out is how un-shiny the finished cloth is, especially when compared to the naked warp threads which positively glow. i tried to catch the difference but a photo really doesn’t do it justice. a couple of changes to my next sample suggested themselves. i doubled the number of warp ends per inch (4 per hole/slot), these threads gather together on the loom, making for a pronounced stripe in the cloth, i’ve no idea if it’s possible they’ll spread themselves out during finishing. i also increased the weight of the weft, in the hope that might produce a more balanced cloth, rather than the weft-face i’ve ended up with. i’ve done a short section with the original weft (2-ply) another with 32-ply to match the 32 threads through each hole and slot (4 x 8-ply threads), and another section with 16-ply (the easiest for me to produce from the threads i already have). i’ve also beaten the weft in harder. the next sample just needs hemstitching before i can cut it off the loom. something else i can look at is degumming before weaving. the degummed threads are really incredible and more than justify the work it takes to reel the silk, it may well be that weaving simply isn’t the best use of those magical qualities, at least on the equipment i have available. 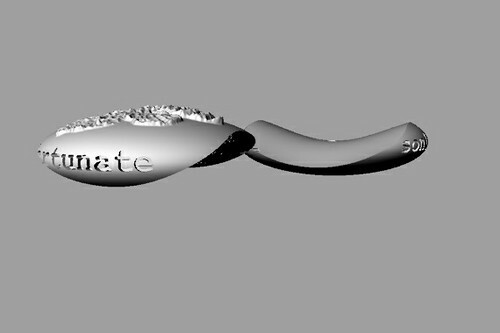 i wanted to make use of the benefits of digital design to make a medal for the bams student medal competition. 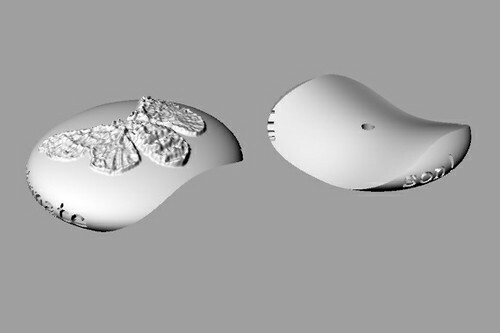 i figured it would be a good way to split a shape with interesting geometry, and to produce two perfectly fitting halves of a whole. initially i had no plans to use digital print in the final piece, i thought i’d just use it to produce a blank for mould-making, but when i saw the results from the powder bed printer i really liked the look and feel of them. it would also save all the additional work of mould making for traditional casting. i hoped by digitally printing i’d be able to include more detail than i could have achieved using casting methods, which still baffle me. my tasks were splitting a solid, engraving text around the edge and inside, placing an accurate centre hole and applying an image to the top surface. 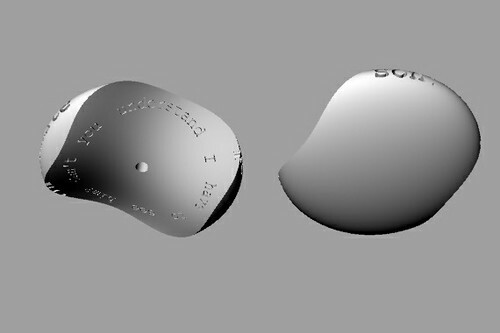 mostly achieved in the end by flow along curve and surface and boolean split/difference to make cuts/holes in the solid. image on top is of a silk moth, bombyx mori. text is from kafka’s metamorphosis “he is my unfortunate son! can’t you understand i have to see him?”. the plan is to cast the plainer bottom half of the medal in clear resin, including spun/woven reeled silk threads and a silk worm from inside a cocoon. the halves will be held together using 4mm neodymium magnets in the central holes. it was brilliant trying the magnets in my first test print, they really brought it to life, gave it the pull of an invisible thread that i was hoping for.